In this feature documentary I went on a journey with Jimmy Murakami, the famous Japanese American animator of classic films like ‘Snowman’ and ‘When the Wind Blows’ and revealed the tragedy he and his family endured in a Japanese Concentration Camp in Northern California during WW2. Jimmy sadly passed away on the 18th February 2014. “My name is Jimmy Murakami. Teruaki is the Japanese name I was born with. It was taken from me in America after Japan bombed Pearl Harbor’. My feature documentary ‘Jimmy Murakami – Non Alien’ has been doing the rounds at film festivals across the globe for the last couple of years, so it feels timely to shed some light on the background to how I came across the story of Jimmy’s tragic childhood in Tule Lake Concentration Camp. I first came across Jimmy in the mid eighties when I began my career as a film editor in Dublin. In the early 70’s Jimmy came to Ireland to work on the feature film ‘Von Richthofen and Brown’ where he met his future wife Ethna and set up roots here. 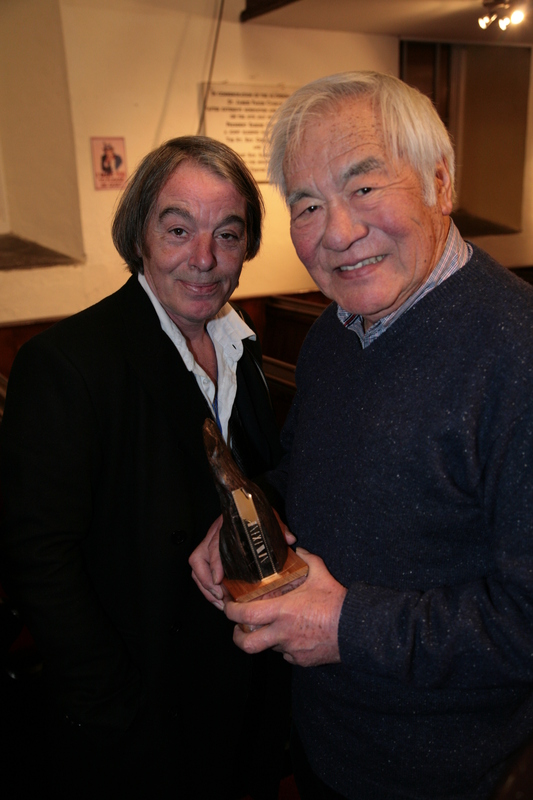 He was an exotic character on the Dublin film scene and I was in awe of the Oscar nominated Japanese American animator whose credits included ‘When the Wind Blows’ and ‘Snowman‘. While assisting him on his films I got to know him reasonably well and viewed some of his early experimental work like his Oscar nominated ‘Breath’ and ‘Death of a Bullet‘. In the Dublin bars Jimmy told wonderful stories about his film life: directing ‘Battle Beyond the Stars’ for Roger Corman, working with David Bowie and Roger Waters from Pink Floyd on the soundtrack for ‘When the Wind Blows’. But Jimmy also had a secret from his childhood that he never shared with any of his friends in Ireland. The main focus of ‘Jimmy Murakami – Non Alien’ is on Jimmy Murakami’s childhood trauma, when he and his family were interned in an American concentration camp after Japan attacked Pearl Harbour in 1942. On the signature of President Roosevelt, 140,000 people of Japanese ancestry were given the new label of ‘Non Alien’ and lost their homes and their civil rights. After four years in camp, Jimmy’s family settled in LA. He went to Art School and then joined an animation studio and the rest is history. I would bump into Jimmy Murakami at various film events and we would swap stories. One night he told me that he was writing his memoirs and also doing some new paintings concerning his childhood in America. I immediately asked if I could come out to his home and film with him. He showed me his memoir and when I read the section dealing with the concentration camps I knew I had to tell his story. The genesis of the completed film is built around the nine paintings Jimmy showed me that day. They became the basis for some wonderful animation sequences created by Jimmy’s great friend Guido Orlandi. 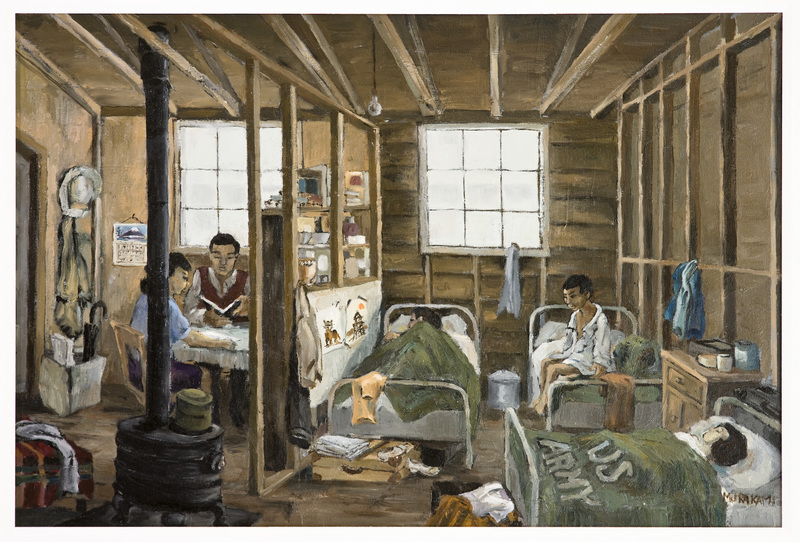 The paintings are mainly representations of Jimmy’s imprisonment in Tule Lake Concentration Camp in Northern California. He had tried to block this tragic episode out of his mind but was now going to confront it in the only way he knew how, through his art! The first painting in the series shows Jimmy’s dad loading all his earthly possessions onto his 1954 yellow Ford, moments before his wife and 4 young children would begin their long journey to Tule Lake Camp in Northern California. They would never see their little farm again. Jimmy was only 8 years old but still has vivid memories of this time. Signs appeared everywhere informing all people of Japanese ancestry to assemble for transportation to concentration camps. Tule Lake became the biggest camp holding 40,000 inmates. Jimmy’s personal stories of the time are the heart of the film. How his older sister died in the camp from Leukemia. How tanks and military surrounded the camp and violence was endemic. How frustrated prisoners allied themselves to the Emperor and vowed to return to Japan. The majority of those interned considered themselves Americans and were angry at being imprisoned for crimes they had no part in. During Ronald Reagan’s stint as president he apologized on behalf of the American people for the injustice inflicted on the Japanese American community and awarded all survivors of the camp $25,000 . Jimmy wanted to buy a new Cadillac and put a sign on it saying “Is this what my life is worth?” and then driving it off a cliff. His wife Ethna pointed out that their financial circumstances were bad and persuaded Jimmy to reluctantly take the cheque. 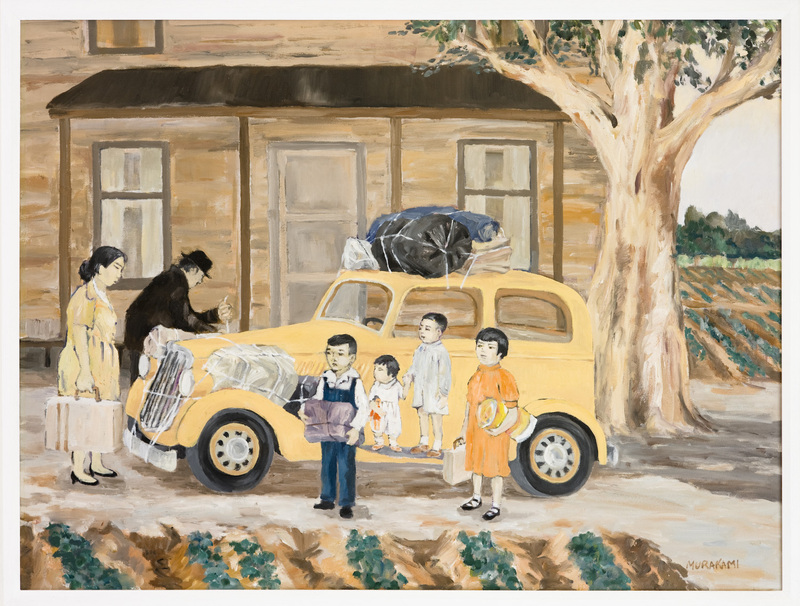 Freedom Train painting depicts Murakami family leaving Tule Lake concentration camp. 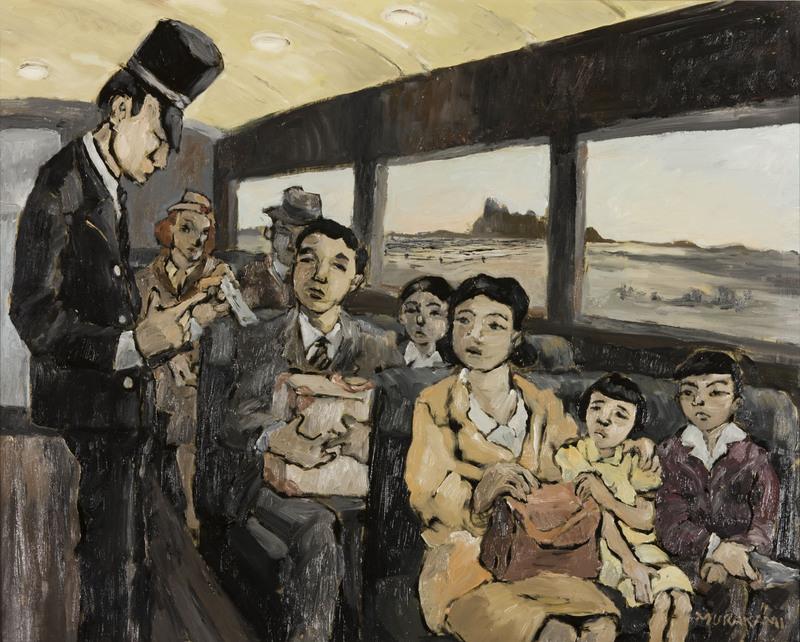 Jimmy Murakami’s final painting was called ‘Freedom Train’ it showed the Murakami family huddled together on a train headed to LA carrying the same suitcases they had entered Tule Lake with four years earlier, they also had the ashes of Jimmy’s sister Sumiko. With lots of research done Loopline Film convinced the Irish Arts Council to award a grant and make a feature documentary on this dark episode in Jimmy’s life. We filmed in Ireland, and the States, met his brother brother and sister, and most pointedly, we followed Jimmy back to Tule Lake where every year there is ceremony for survivors and their children. In the end a chance encounter with an old friend took me on a journey back to Jimmy’s childhood through his painting and specially commissioned animation. The film premiered to great acclaim at the Dublin Film Festival and has gone to international screenings in America and Japan. The film won the ‘Directors Choice Award’ at the International Sacramento Film and Music Festival, voted second best film at the Dublin Film Festival and got a showcase screening in Hiroshima. We are currently making a one hour TV special for broadcasters. Plans are also afoot to release the film on DVD and Streaming. This entry was posted in Jimmy Murakami - Non Alien and tagged Access Cinema, Animation, Cannes MIP, Dublin Film Festival, IFTN, Irish Arts Council, irish film board, Japan Film Festival, Japanese internment, Jimmy Murakami, Loopline Film, Merrydance, Monster Film Distributors, Non Alien, Pearl Harbor, Roger Corman, Sé Merry Doyle, The Snowman, Tule Lake, Vanessa Gildea, When the wind Blows, WW2 on August 11, 2011 by Sé Merry Doyle.